my name engraved on it! I love everything they sent to me! Located in Carlsbad California, their facility houses state-of-the-art equipment to meet and exceed every engraving challenge. Gunther Gifts Inc. is located in the sunny Southern California city of Carlsbad. They engrave, package and ship all your special gifts nationwide from their factory warehouse. 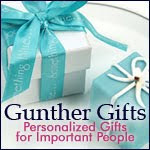 Find out why Fortune 500 companies recommend Gunther Gifts to their customers. With over 29 years engraving and manufacturing experience, you can always trust the quality and attention to detail in every product we customize. Personalized gifts hold a special meaning to the recipient. It demonstrates that you went the extra mile to select a unique gift that shows you care. Special occasions and milestones memorialized in a personalized gift are cherished and last a lifetime. Birthdays, weddings, anniversaries, births, graduations, new jobs, promotions, corporate gifts, client and employee appreciation, safety awards, holidays, new car, new home, religious events, are just a few ideas in which a personalized gift is appropriate and appreciated. In order to offer you the most unique and interesting products, they constantly strive to innovate engraving techniques and custom templates with styles available exclusively from Gunther Gifts. They were the first in the nation to offer engraving on Swiss Army knives! winner a $50 gift card! Oh my goodness, my neice is getting married! How awesome if I could win this!! The robe sounds really nice! My cousin is getting married soon and I would give this to her! Sweet I would love this! We are getting married next March so this would be perfect! I will link this giveaway on my Facebook right now. Wow they even have leather wallets! traci s tracisme@gmail.com this sounds like a great prize, hope to win! What a fun shop for wedding gifts! My husbands birthday is coming! This is perfect! This would be awesome if I win because I can pass it on to my sister who is getting married in a few months. wow! they have a huge selection!!! I could sure use one of the leather wallets for my hubby! Gunther has SO many great products, it would be hard to choose what to buy! This would sure come in handy with Christmas coming up! Looks like they have some really beautiful stuff! Thanks!